Good Morning all! It's time for another fresh challenge here at DYSU! We had some fabulous Flag creations last week, making it so hard for us to choose the Top Three! Thank you all for continuing to inspire and create with us here at DYSU. This week we have the theme of Use Scallops in your creations! Scallop die cuts, scallop punches, scallop patterns, Scallops! 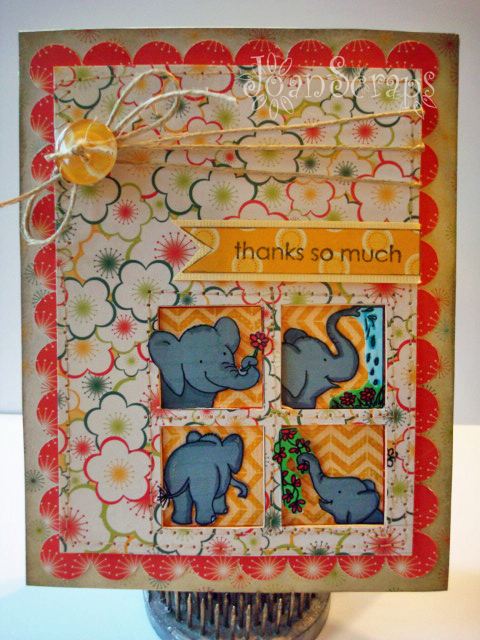 My card for this week uses an image from Little Claire Designs named Elephants Squares. It was so much fun working with this image, very good quality and friendly for paper piecing. I am submitting it to the Anything goes challenge at Simon Says Stamps. This week the theme there is Anytthing goes. Hope you have a great day!! And remember to smile... tomorrow is Friday!!! Beautiful card Joan - love the bright colours and the fab paper piecing. Gorgeous card Joan! Love these sweet elephants snd the fab papers! I adore this! The little windows are perfect. I love the colors and patterns...great design! Me gustaron los colores y los elefantitos, que chulos! this card made me smile! love the pattern paper and the great paper piecing. twine is always a great piece of embellishment! Wonderful creation! 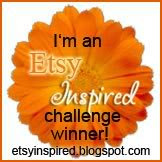 Thanks for playing along in the Anything Goes Challenge over at the Simon Says Stamp Challenge Blog!